Julian II. AD 360 to 363. Silver siliqua. Probably ancient counterfeit. Size : 16.0 x 17.0 mm. Weight : 1.83 grams. Reference : RIC Vol. VIII, page 168, #363 variety. 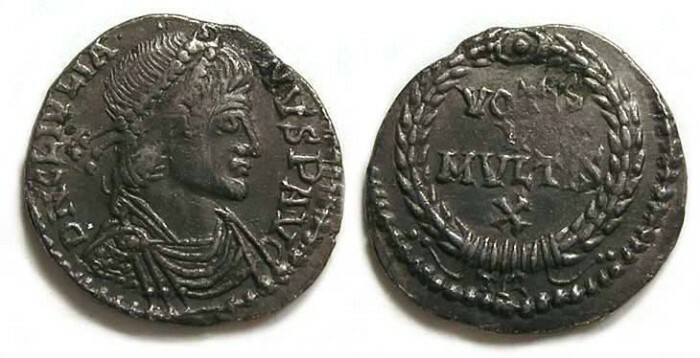 Obverse : Head of Julian II right, with DN CL IVLIANVS P AVG around (due to the clipping, parts of some letters are off the flan). Reverse : VOTIS V MULTIS X in four lines in a wreath, with TR below. This coin has several problems. First, at 1.83 grams it is about 0.4 grams lighter than one would expect on this issue. Second, the obverse inscription is slightly odd (it should be either D N CL IVLIANVS AVG or FL CL IVLIANVS AVG) on this issue. Third, the style is incorrect for the mint. The coin is clearly ancient, so it pretty much has to be an ancient counterfeit struck in fairly good silver but low weight.